Numerous descriptions of medieval travelers indicate that the name Troy stood not only for a city but for a whole region. That no remains of the actual city are visible today has several reasons. The ruins of the lower city, so it is said, were buried in the plain under mudslides. In addition, geological processes such as erosion and deposition, and also agricultural use, changed the topography. Ruins that had survived all these processes were systematically removed to obtain building material. 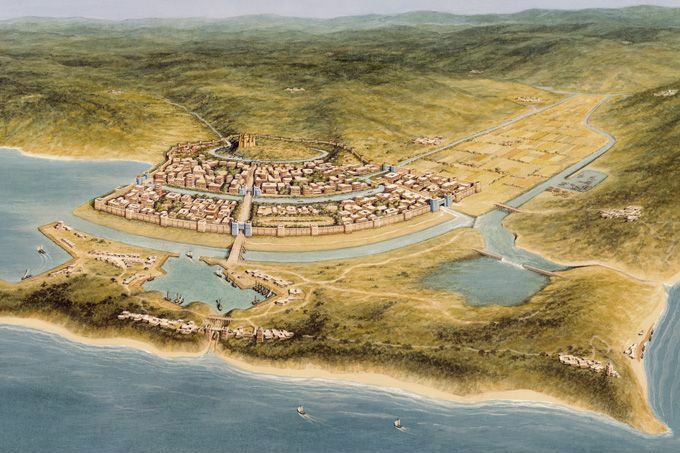 During the 6th century CE, Hisarlık apparently was completely abandoned; the name of Troy, however, remained connected with the surrounding area. From the 12th century onward, we have notes and descriptions of visitors whose ships anchored near Troy. Even though they landed in different places, the locals always referred to it as Troy – no matter where they set ashore; this is why the whole area became known as the Troad. Ramon Muntaner, governor of Gallipoli from 1305 to 1309, stated in his memoir that the city of Troy had a circumference of three hundred miles. The gates of Troy were located both in Cyzicus at the Sea of Marmara and near the Gulf of Edremit – about 100 kilometers apart. In the fall of 1437, the Spanish nobleman Pedro Tafur rode from Chios to the north until he reached Adramyttion at the Gulf of Edremit, where he had seemingly reached “Troy.” He then followed the coast further north to “Ilion,” located opposite the island of Tenedos. In 1599, Thomas Dallam reached the Troad as part of the entourage of Sultan Mehmet III. He first anchored on the west coast opposite Tenedos and could see from there what were considered to be the ruins of Troy. He then went on towards the north and landed at Sigeion, from there he could see the ruins “up close.” Obviously, he believed that he was dealing with a single, massive archaeological site. There is not much of a discrepancy between these descriptions and the working hypothesis put forward here. The references to an entire region named Troy, covering today’s Troad, should not be taken entirely at face value, but they should be taken seriously and investigated. The term Troy may well have referred to more than the city, as if the case for New York City and New York State today. The kingdom could have stretched from the Marmara Sea all the way south to the Gulf of Edremit. If ancient sources speak of gold, copper and even brass from “Troy,” they are clearly referring to the rich mines in the hinterland of the Biga peninsula – and not to the settlement on Hisarlık that is now considered Troy. A layperson might be surprised to find that today nothing is left of the remains of Troy outside the citadel itself. This is partly due to erosion and deposition, which have changed the topography over the past 3000 years. Settlement layers on hills have been eroded, whereas those in the plain were covered by subsequent sedimentation. Millennia of agricultural use are responsible for increasing these effects beyond their natural extent – especially after the invention of tractors with plows that reach almost one meter into the soil. Human-made erosion can go so far that survey points from the 1960s tower a few meters above today’s surroundings. The bedrock around the floodplain of Troy consists of Tertiary marls, a soft sediment that can be plowed without difficulty. In such a fragile geological substrate, landslides occur frequently. Frank Calvert, who had made Heinrich Schliemann aware of Hisarlık’s potential, described landslides from the marl in which over one million cubic meters of material was moved, though he saw them on the steep banks of the southern coast of the Dardanelles and not around the floodplain. Nevertheless, the city of Troy still exists and the ruins left after the destruction (of Troy VIIa) are potentially exceedingly well-preserved. If one draws a cross-section through the royal citadel on Hisarlık and extends it into the plain, it turns out that the remains of the lower town lie 5 to 7 meters below the surface of the modern floodplain. Stratified deposits full of artifacts, even entire building remains, have been identified in drill cores stretching several hundred meters apart. de Clavijo, Ruy Gonzalez (1928): Embassy to Tamerlane 1403-1406. Harper, London, 1-375. Easton, Donald (1991): “Troy before Schliemann.” Studia Troica 1, 111-129. Reichel, Michael (2011): “Epische Dichtung.” Handbuch der griechischen Literatur der Antike, vol. 1. Bernhard Zimmermann (ed. ), C. H. Beck, München, 1-816. Wright, Thomas (1848): Early Travels in Palestine. Henry G. Bohn, London, 1-517. And you, my lord – I understand there was a time when fortune smiles upon you also. They say that there was no one to compare with you for wealth and splendid sons in all the lands that are contained by Lesbos in the sea, where Macar reigned, to Upper Phrygia and the boundless Hellespont. If one wants to believe in the Iliad, then the king [Priam] not only ruled in the city and its surroundings, but in a larger area. In the south, his empire stretched as far as the mountain range of Ida and in the east to the land of the Phrygians, which means up to today’s Sea of Marmara. Ilios … refers to the besieged city, Troie, however, was not only the town but also the landscape bearing the same name, as well as the country and the kingdom of the Trojans. Originally the term Troy denoted the wider region, in which the city of Ilios is located. Thus behind the apparently rival claims [of the local people] lay a belief that the ruins of Troy were not restricted to one site, but covered a wide area. The notion of an outsize Troy, even one that had occupied the whole of the Troad, is actually made explicit in other sources. In ancient days settlements of the city of Troy occupied the whole space of countryside between this spot and the land down even to Cape St. Mary [Baba Burun] … which is a plain of some sixty miles in extent. [We] came to the island of Tenit [Tenedos], near which … was the very ancient and famous city of Troy, the ruins of which the Greeks say, are still apparent over a space of many miles.